Got a dream car? You probably don’t want a nightmare garage. What can you do? Well, you can paint the garage, but that doesn’t last very long. Eventually, you will have to be out there painting again like you are Michelangelo painting the Sistine Chapel. Next, you think “why not Epoxy?” It comes in cool patterns and colors and lasts longer than paint. However, the installation would definitely take a professional and if it gets damaged, your floor is gonna look just like it does now. Looking for a popular third option? Check out vinyl garage rolls! Our vinyl garage rolls are the perfect alternatives to paint and epoxy because of their maintenance-free nature. These rolls can be installed by any weekend warrior and are very easy to clean and maintain. These vinyl garage rolls are available in several colors and patterns like coin and diamond. 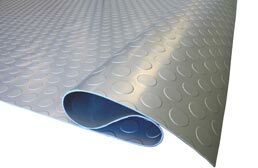 Available in several sizes, these rolls can be used as flooring for your whole garage or as a garage mat. Vinyl garage rolls are not only great for your garage, but they are also great in your home or business. Since these rolls have been designed for the harsh environment of a garage, they are certain to withstand the abuses found in any home or business. Use these rolls as flooring for bathrooms, kitchens, basements, office lobbies, in car dealerships and much more. These vinyl rolls are very easy to install and maintain and are mold and mildew resistant. Want to learn more? Let’s take a look! One of the number one concerns for people who live in areas of the country where real weather happens: How do I contain all the mud, water and snow from getting all over my garage floor? With an Auto Floor Guard garage mat, this question is answered. 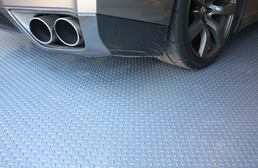 These mats have been designed specifically to keep the outside elements from affecting your garage floor. 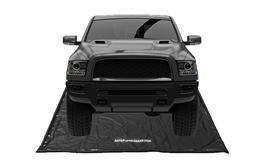 These garage mats are essentially a large containment mat for your car and will contain any water, snow or mud that were to fall from your car. This helps to protect your new garage floor from getting damaged or stained and is beneficial to any floor that has an Epoxy or painted finish. 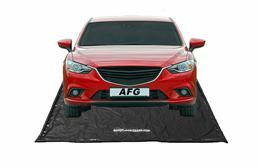 These mats are very easy to install and maintain: just pull the mat out of the garage and empty out the contents. Clean up is easy with the use of a garden hose. Once clean and dry, place the garage mat back into the garage. Sometimes you aren’t looking for a whole floor. Sometimes you’re a cool motorcycle rider who really wants a pedestal for their bike. While we don’t sell pedestals (yet!) we do sell motorcycle mats! 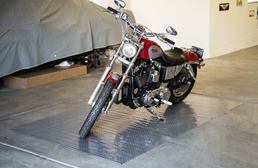 Motorcycle mats are a great way to protect your garage floor and your motorcycle. 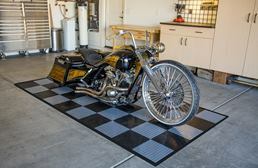 We offer three types of motorcycle mats: Diamond Nitro Motorcycle Mats, Sports Fan Mats, and Nitro Tile Motorcycle Mats. 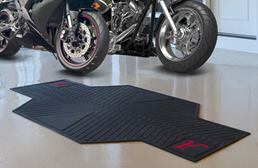 Our Diamond Nitro Motorcycle Mat is our Diamond Nitro Roll cut to the perfect size for your motorcycle. Simply roll out, and you’re ready to go! We also offer motorcycle mats featuring your favorite sports team. These mats offer a gripped bottom to prevent slippage, and have your team’s logo! 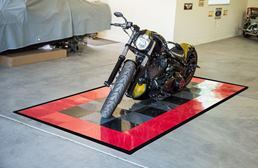 If you’re looking for something with a bit more shine, our Nitro Tile Motorcycle Mats are easily snapped together and come with finished edges. 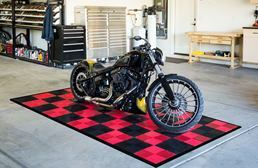 No matter what your preference, we got a motorcycle mat for you. Vinyl garage rolls are easy to install. Because these mats are so large, they are very heavy. Don’t worry, this is a good thing! When installing them in a garage, we recommend not gluing or taping the mat down. This allows your garage flooring to properly expand and contract throughout the day. 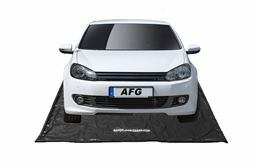 If for some reason the mat is moving when driving in and out of your driveway, you might want to slow down, Speed Racer! It’s just you! In all seriousness, you can use a pressure sensitive adhesive around the edge of the mat or double sided tape. Install during the warmest part of the day. This will make sure that when the roll is installed, it is at its largest size. This is crucial for the expansion gap. If you install during the coldest part the day your floor will be at its smallest size. So when it expands, it will bunch up against any walls or other obstructions. This will cause a bubble to form in various places in your floor. Nobody has time for that! The first is tar from the street. Street tar will make marks on any surface. This type of staining is easily fixed with the use of cleaners. The best cleaner for this is called Purple Power. Got any questions? Give one of our Flooring Heroes a call!